Has there been a fictional literary character that has appeared in more television series, films, radio plays, novels and short stories than Sir Arthur Conan Doyle’s most famous creation, the detective Sherlock Holmes? Back in 2012 no less an institution than Guiness World Records certified that the great sleuth had been portrayed in some 254 depictions in film and television alone, and that number must surely have reached 300 in the span of a further six years. But that impressive record is easily dwarfed by the number of literary tales that Holmes has been a character in: thousands of short stories, novellas and novels have been written since Doyle finished writing the canonical Holmes stories, and will surely continue on into the distant future, such is the enduring popularity of Holmes, Watson and their supporting cast of characters. The variety of depictions, portrayals and angles to be seen in the endless pastiches of Holmes is almost endless – he has been male, female, an alien, a vampire, he has investigated murders, occult mysteries, fought the minions of the elder gods, travelled through space and time, been set in the modern day, the distant future and the distant past and a million other variations. Are there any truly original depictions left for the character? I honestly don’t know – I’m not sure if there’s been a Holmes operetta as of writing – but I would suspect not. As such, I find when reading pastiches of Sherlock Holmes that it is best to try and ignore the originality of the tale, and instead focus on its inherent quality; it is almost inevitable that the approach taken will have been done before, either broadly or specifically, and therefore I judge it based on how much I enjoyed the tale itself. I always enjoy a well-told and well-written Holmes pastiche, and on my bookshelves (both physical and virtual) I have dozens of novels and anthologies centered on the occupant of 221B Baker Street. Therefore when EDGE Science Fiction and Fantasy Publishing announced that they were publishing Gaslight Gothic – Strange Tales of Sherlock Holmes, I was one of the first to request an advanced review copy to review. The fourth entry in the Gaslight series published by EDGE, as the title suggests this collection of short stories focuses on providing a Gothic theme, which meshes well with the existing Holmes canon. In fact, as the introduction by editor Charles Prepolec highlights, this very much returns to the origins of the Holmes canon, as many of Conan Doyle’s original stories are thematically rooted in gothic imagery and the gothic tradition; Prepolec cites the ‘dual nature’ of Conan Doyle, a man who relied on scientific deduction to clear wrongful convictions in court, yet also fervently believed in Spiritualism and faeries, and this duality can often be found in the Holmes stories that he wrote. As a side note, I’d like to state that this is yet another excellent introductory chapter from an EDGE publication, very similar in quality to the one found in By The Light of Camelot which I also recently reviewed. The majority of introductions I read in anthologies seem to do little more than list the authors found in the collection, and summarise their stories; but these introductions actually help prepare you for what you are about to read, highlighting the themes and focus to be found in the stories, and the background for why the editors and publisher took the decision to produce the title. As with the other EDGE publications I’ve reviewed, Gaslight Gothic has a fantastic piece of cover art, this time by Dave Elsey. The smog-covered streets of London lurk in the background as a sallow-faced and distinctly unhealthy-looking Holmes lights a match for his pipe, and a distinctly Ripper-like figure lurks behind him, wickedly-sharp knife in hand and a bizarre metallic contraption covering the lower-half of his face. It’s a piece that perfectly sums up the gothic theme of the anthology, and another cover of such high quality that I’d love to have a copy framed on my study wall. Moving onto the contents of the anthology, it contains a total of ten short stories; and although that’s a relatively low number compared to other anthologies, they are distinctly longer than an average short story, not to mention all maintaining a consistently high quality of writing. The opening story by Mark A. Latham, The Cuckoo’s Hour, is not only a strong opening story and one of the best in the anthology, but also one of the best Sherlock Holmes stories I’ve ever come across. Latham seems to have an innate understanding of the Holmes canon and characters, as well as how to write gothic fiction, to the extent that there are times when the story feels less like a pastiche and more like a piece of fiction Conan Doyle might have written in his later, more spiritual years. It’s effective as both a detective story and a piece of quiet horror, and features an ending that is genuinely unnerving, both in terms of its implications and the subtle way that Latham introduces such a twist. Father of the Man by Stephen Volk is another excellent read, one of the longest in the collection and also the most intriguing in its concept: portraying a younger Holmes, it posits the idea that Holmes was mentored as a detective and investigator by Edgar Allan Poe, one of the originators of the gothic fiction genre; Poe did not die in mysterious circumstances in America, but instead fled to France under an assumed identity and worked as an investigating detective, taking Holmes under his wing. It’s actually an original and interesting idea, and one that Volk takes full advantage of, rapidly developing a believable relationship between mentor and mentee, and skilfully weaving a plot that sees Poe’s previous life come back to haunt him. There’s some great characterisation, particularly in regards to Poe, and some incredibly tense scenes when Poe and Holmes are forced to re-enact one of Poe’s famous stories in order to try and resolve the situation they find themselves in. It’s a universe that is full of potential, and I would very much like to see more stories set in it. It’s always a good sign when you see James Lovegrove attached to an anthology, and even moreso when it’s a Sherlock Holmes anthology. Mr. Lovegrove has written a number of Holmes novels and short stories and they have always been immensely enjoyable. In particular, he has been one of the few authors to try and bring back the ‘original’ Watson from the early Holmes canon, rather than the later simpleton; the Watsons to be found in his tales are always proactive rather than passive, fiercely independent and actually intelligent, rather than the canine-like ‘faithful companion’ that seems to be the default for most Holmes pastiches. 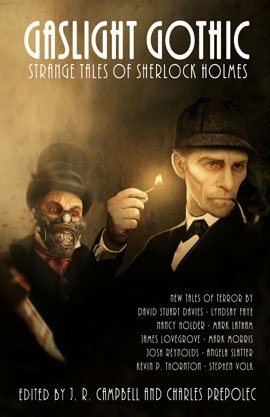 He has also begun writing a series of novels that pits Holmes against the Lovecraftian Elder Gods and his story for this anthology, The Strange Case of Dr Sacker and Mr Hope, has a similarly occult, cosmic horror angle; taking inspiration from Conan Doyle’s original names for Holmes and Watson, he effortlessly weaves a bizarre, dream-like and hugely enjoyable tale that focuses on the conflicting dual natures of Holmes as a character, and what the consequences might be if one were allowed to reign supreme over the other. It has an ending that completely fooled me, taking Holmes and Watson down a very dark path that reminded me of Neil Gaiman’s A Study in Emerald, and is another stand-out story in the anthology. Josh Reynolds is one of my favourite authors, particularly when it comes to cosmic horror and occult detective tales; his Royal Occultist series of novels and short stories is by far the best occult detective to have been created in the 21st Century, and he has a way of mixing the ‘normal’ and the occult that always makes his stories memorable. The Ignoble Sportsmen is no exception, drenched in gothic and occult imagery, and despite featuring a blood-chilling and terrifying antagonist, Reynold’s skill as an author is such that he is able to make this monster genuinely sympathetic in some ways, tying into the theme from certain of the canon Holmes stories that there are times when justice must be served externally, outside of normal means, if the law itself cannot impose sufficient penalties. The Magic of Africa is a short but darkly amusing tale by Kevin P. Thornton that takes a seemingly impossible murder and provides multiple solutions – the first a ‘normal’ Holmesian solution involving disgruntled antagonists and some seemingly-impressive acrobatics; and then a second, occult solution that is only witnessed by a single character, and which highlights the foolishness of attempting to fit impossible facts into any plausible narrative. A Matter of Light by Angela Slatter is another interesting story in the anthology, and is perhaps the one that gave me the most to think about in terms of Holmes and Watson as characters. Featuring another occult detective, the character Kit Caswell (who I understand has featured in other works by the author), it’s a brilliant and multi-faceted story that really deserves multiple readings to fully comprehend everything to be found in its relatively short word-count. On the first reading, it’s a clever and inventive murder-mystery that makes use of social taboos that Conan Doyle would not have dared stray into in his canon writings, albeit with an overt occult angle at the end. But further readings highlight the difficulties that a female detective (occult or otherwise) would have encountered had they attempted to follow in Holmes’ footsteps; and in particular, Slatter uses this angle to throw light on some of the far less savoury aspects of Holmes as a character, particularly that much-lauded aspect of his ‘chivalry’ towards women which would obviously be seen in a much different light by the women themselves. Finally, The Song of Want by Lyndsay Faye is an excellent closing story which takes a grim and often uncompromising look at the backstories of the Baker Street Irregulars; although portrayed in the canon stories as a cheerful group of urchins employed by Holmes for various menial tasks, Faye immediately pulls the rug out from under the reader by portraying the harsh and unsentimental realities of how the ‘Irregulars’ would have lived when not working for Holmes. The story itself is a subtle and deeply unsettling one, particularly as it involves an antagonist who becomes involved with some of the Irregulars, and there are some fantastically ambiguous conclusions to be drawn from its last few pages. In conclusion, Gaslight Gothic is another impressive publication from EDGE Science Fiction and Fantasy Publishing, and also a credit to the editors. They have put together some fantastically high-quality Sherlock Holmes stories which fully take advantage of the anthology’s gothic theme, including stories that provide moments of genuine horror, frank interrogations of the nature of gothic fiction and Sherlock Holmes as a character, and some genuinely unnerving endings. If only all Sherlock Holmes anthologies could be of this quality.